I had been with the Agency for several years, and had certainly earned my spurs. Two years in Central America followed by thirteen months assigned to a Counter Terrorist Team (C7F) in the Central Highlands of Vietnam before being wounded, had elevated me to near celebrity status. By every agency means of measurement, by every outward appearance, I was a proven field tested product that could do more than just get the job done; in Company terms, a high value asset. I had become a hunter in the purest sense of the word, a predator. My success quotient was measured by how effectively I hunted and neutralized each assignment, put the VCI (Viet Cong infrastructure) on my tote board before they put me on theirs. It was predator to predator. It was never an even playing field. There were no boundaries and nearly zero accountability. The smell of death was the essence of my existence. I developed a case hardened exterior that kept me from trusting all but a selected few. I would endure frequent prolonged periods of psychotic paranoia that kept me beyond the edge. The edge that sharpens my senses, to where I can smell fear on those around me, the edge that allows me to hunt and kill selectively without remorse, without conscience. The edge that isolates me and takes me further and further from the relative innocence of the lives of those I left behind. Nearly gone are the infrequent, short, compassion laden dreams driven by a dimming memory of inner need to be back before the beginning of this cerebral torment. Back to where I could feel. Back to where there were no shadows, no psychosis, no paranoia, no smell of death. Those thoughts have been somehow lost. Lost to the all enveloping reality of the endless depth of the rock hard quarry of corruption that lay ahead of me. My job has always been in covert operations. It is a job that I sometimes find detestable. It's a love hate relationship. Yet it is always all consuming. To me the job is more addictive than any narcotic on the planet. I had to go back. For me it was the only game in town. On Monday, October 9, 1967 with my wife pregnant with our third child, I got the word. Back to Nam. I was torn apart emotionally, but I was driven. I arrived at Bein Hoa on a Braniff Air charter on Saturday, December 2, 1967. From there I managed to grab a slick (Huey Troop Helicopter) to Saigon. I reported to the headquarters of the Phoenix Directorate. I waited there three days before being ordered to Pakxe, a secret Provisional Reconnaissance Unit (PRU) Interrogation Center near the Laos, Thailand border. This time it was a little different that in 65. I knew my way around. I was an unexpected asset. A CTT veteran, with substantial current conflict covert OPS experience, and looking for work. I wanted work and the PRU needed experienced personnel in a bad way. From then on it was high speed, non-stop. High casualty rates, some shaky high level Phoenix Directorate decisions and then came the TET offensive. That's when it all turned. I was on stand down at Pakxe, when I was casually introduced to a Major Cuneo, from FOB 3 (Forwarding Operating Base) Khe Sanh. Cuneo worked for still another secret organization. The meeting lasted a little more than an hour, with the Major looking me over and vice versa. I knew I hadn't seen the last of him. It wasn't long after that meeting that PRU losses started to go through the overhead. I was given a heads up from the boss that some Phoenix Directorate heavyweights from Saigon were coming in to meet with me. After that meeting and briefing, I was cleared for a second meeting with Major Cuneo and a Lao Colonel. On Wednesday, January 31st, we met at Pakxe and I was briefed on a highly sensitive secret mission. There was a different wrinkle here. This had to do with allegations of treason involving CIA personnel. This was Secret from everyone! At the end of the briefing, I didn't have to think about a thing; I took the mission. The mission AO (Area of Operation) was high up in Southeast Laos. The allegations of treason geometrically increased the level of danger. With bad guys inside the operation, I could get waxed and forgotten about in the blink of an eye. But I read people really well. I could see it in Major Cuneo's eyes. This guy was for real. I also knew it would be suicide for Cuneo to report what he did about individuals in the agency if it wasn't fact. I started to prepare my team for the mission. On Sunday, February 4th, at 1800 hours, my team designated "Rock Slide" arrived at FOB 3, Khe Sanh. I met briefly with Cuneo and settled my team down. On Monday, February 5th, 1 conducted an overflight of my AO with the Major. On Tuesday, February 6th at 0630 hours, we departed FOB 3. Rock Slide was in motion! Then on Tuesday, February 13, 1968, three hours after providing an encoded back channel (Classified Radio Frequency) sitrep (Situation Report), my team got hit. It was clear to me that we had been betrayed. They knew where we were. You couldn't trust anyone! I was wounded four times in less than thirty minutes. I would live beyond this treachery. I would not die! If they wanted what I have they had to take it! I would not give it to them! The lucrative drug trade had created a confusing mess of players from all sides, each of who would stop at nothing. Shortly after insertion, the security for the mission is compromised, and the author's team is ambushed and left to die. He miraculously survives - along with evidence - but not before seeing one of his best men die in his arms after trying to save the author's life. From this point forward, the plot thickens and the intrigue of the espionage world unfolds for the reader. Across three continents, the author's team discovers the men and women behind the treason. And throughout the journey there is a life and death struggle to move forward while seeing that any comrades left behind are somehow rescued. Friends are few, and trusting anyone is foolish. But in the Black Ops, that's part of the job. This betrayal is ugly and deep, including a Federal court judge to foreign diplomats, and with money and power as the prize, takers are everywhere and nobody is beyond reproach. Inside this gross injustice, a few good men do exist, guided by a higher code. The author and his team are lucky to be among them. It takes nearly 30 years of skill and expertise to ferret out the entire cell of "bad boys" within the intelligence community, but ultimately perseverance pays off, Treason, after all, can never be forgiven. There is a fine line in the Black Ops world between doing one's job and crossing over to resemble the people you are hunting. Some don't make it, some are destroyed by it, and no one is ever the same. The author hopes that shedding light on the horror that espionage can be will enable people to strengthen their resolve to seek the truth. If we remove our blinders, the book hopes, there will be no place left for the "bad boys' to hide. Nick Manion is a native of Roxbury, MA, one of Boston's colorful Irish neighborhoods. A son of Irish immigrants, Nick earned a reputation early on as a tough, resourceful kid. Like many of the rugged youth in his neighborhood, Nick joined the Army. In 1960, he started basic training at Fort Dix in New Jersey and subsequently earned his Paratrooper qualification at the Airborne Jump School at Fort Benning, Georgia. Nick's first permanent duty station was the Aberdeen Proving Grounds in Maryland. While at Aberdeen, Nick entered Ranger School, and he eventually completed his US Army Ranger training at Fort Benning, Georgia. Immediately after graduating, he joined one of the highly secret units in the US intelligence community. Nick spent his first tour at Fort Sheridan in Panama where he soon specialized in jungle warfare tactics. It was during this time that he also started surveillance on the campuses of several New England colleges and universities. This was the start of the turbulent 1960s, with the rise of groups such as the Weathermen and the Students for a Democratic Society (SDS), and Nick was serving on the front lines. 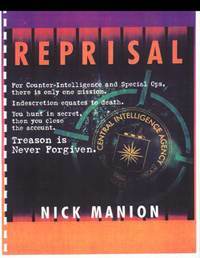 At the end of his first tour, Nick was assigned to the 11th Special Forces stationed on the Boston Army Base, and he continued gathering intelligence on subversive groups operating on college campuses. As the Vietnam conflict heated up in late 1964, Nick was assigned to a counter terrorist team operating in Southeast Asia through 1965 when he was ambushed and hurt real bad. He returned to the states and healed and did Regional work until December 1967. He returned to Nam and was wounded for a second time on February 13, 1968. After Vietnam, Nick continued as an operative within the US intelligence community, eventually developing a specialty in Latin America. Over the years, he has traveled from the jungles of Central America to barrios of Mexico City. Today, Nick is officially retired from formal duty, but he continues to serve as a consultant within the intelligence community. He lives in the Boston area.